The Environmental Section participates on several committees of the Lake Superior Binational Program, including the Chemical Committee. The Chemical Committee is concerned with issues of chemical contamination in the evironment, fish, and wildlife, particularly in relation to the Zero Discharge Demonstration Program (ZDDP). The goal of the ZDDP is to achieve zero emission of nine persistent bioaccumlative toxic (PBT) substances within the Lake Superior basin by 2020. The Chemical Committee prepares the Critical Chemical Reaction Milestones Report, which is published every five years to discuss progess under the ZDDP. The Chemical Committee is also involved in compiling and reviewing contaminant data collected during the Lake Superior Year of Intensive Monitoring, which occurs every five years as a part of the U.S. Environmental Protection Agency and Enivironment Canada's Coordinated Science and Monitoring Initiative (CSMI). 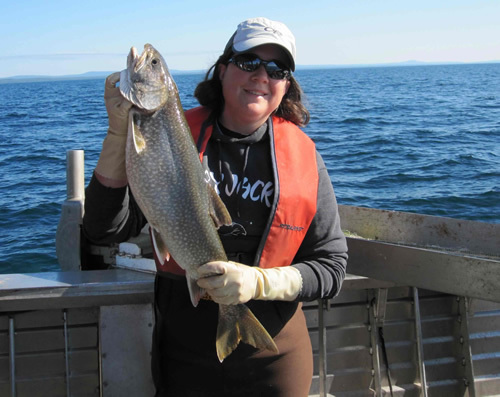 The Environmental Section has conducted a number of studies examining contaminants levels in Lake Superior fish in areas where tribal harvest occurs. Past studies have measured the concentrations of chemical contaminants (i.e., mercury, chlorodanes, PCB's, DDT's, aldrin/dieldrin, heptachlor, mirex) in lake trout, whitefish, and cisco from Lake Superior in comparison to the U.S. Food and Drug Administration's (FDA) environmental chemical concentration limits for the sale of fish. Contaminant concentrations in filet samples from all three species were well below the FDA limits. Other studies measured 37 contaminants in juvenile lake sturgeon and dioxdins and furans in five species of Lake Superior fish- sturgeon, cisco, whitefish, lake trout, and siscowet trout. The Environmental Section has compiled and mantains fish contaminant databases for Lake Superior and the inland waters of Wisconsin, Michigan, and Minnesota's ceded territories. Databases are updated annually and include fish contaminant data collected by GLIFWC as well as data colleted and shared by the Wisconsin Department of Natural Resources (WDNR), Minnesota Department of Health, and Michigan Department of Environmental Quality. The Environmental Section has been involved in studies that have examined trends in mercury levels in fish. In 2007, GLIFWC published a paper on the time trends of methylmercury in walleye in the ceded territories of northern Wisconsin. The data included nearly 6000 walleye filets collected since 1982 by GLIFWC, WDNR, and the Lac du Flambeau Tribe. A slight regional decrease in walleye methylmercury of 0.60% annually was found. In 2011, the Environmental Section co-authored a paper that examined spatial and temporal trends of mercury in walleye and largemouth bass since 1970 across the Great Lakes Region. Although this study also found a decreasing trend in mercury in these species overall, there was also evidence that the trend may have reversed in some areas, with mercury increasing. Muskellunge, like walleye, are top predators within the freshwater food web. As a result, they tend to accumulate mercury at higher levels than many other fish species. Yet, muskellunge are an important food resource for GLIFWC's member tribes. The Environemental Section monitors mercury in muskellunge and compiles the data into the fish contaminant databases, along with data on mercury in muskellunge from WDNR, Minnesota Department of Health, and Michigan Department of Environmental Quality. Fish waste, which is very high in nitrogen, can be used to create a rich compost for gardening. In response to concerns about the potential presence of mercury in fish-dervied compost and plants grown from soil treated with this compost, the Environemntal Section staff conducted a pilot project using fish waste from its annual spring mercury walleye collections. The primary objectives of this project were to develop the process of composting this fish waste and to follow the mercury in the fish waste from initial compost pile to the edible parts of plants grown in the garden soil treated with the compost. 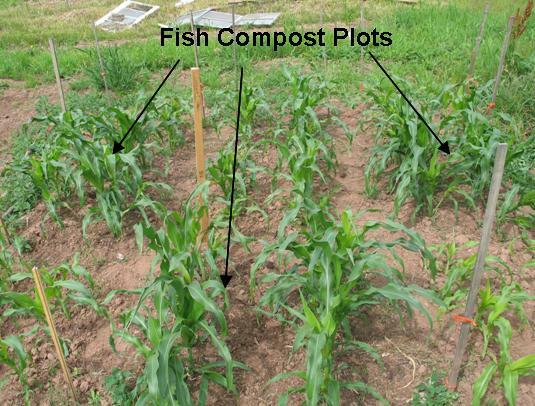 Although mercury was detectable in the compost itself, it was not detected in corn grown in plots with fish compost. In addition, the corn grew faster and appeared healthier than plants grown with commerically available or no compost. The mercury concentrations in walleye filets in some water bodies fluctuate and tend to be high, especially in flowages. The purpose of this study was to determine if the water quality or physical characteristics of eight important walleye spearing reserviors could explain differences in mercury concentrations in walleye filets among these water bodies. The study found that certain water quality charateristics e.g., alkalinity, color, turbidity) correlated with increased mercury concentrations in walleye filets. 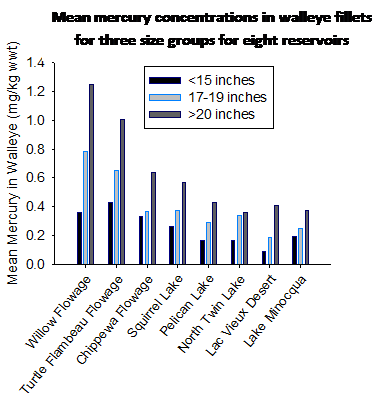 In addition, increased wetlands areas within 500 m of the reservior, maximum allowable discharge, and mean daily discarge correlated with increased mercury in walleye filtes. Mercury and copper are released during copper mining and ore processing. These heavy metals can be toxic to fish and methylmercury can accumulate in fish tissue to levels that may pose a risk to human health. Copper mining and processing were major industries in the Keweenaw Peninsula of Michigan during the mid-1800's. Mining processes released mercury as a byproduct into the air. Furthermore, the unused portion of the ore after the desired minerals were removed (i.e. tailings) were dumped into Lake Superior, forming large shoals referred to as stamp sands. Copper and mercury present in the tailings were likely released into the waters around the Keweenaw Peninsula, the location of several lake trout and whitefish spawing reefs. These lake trout and whitefish populations have significant cultural and economic importance to the Anishinaabeg. The purpose of this study was to determine the mercury and copper concentrations in the muscle tissue of lake trout and whitefish, in size ranges commonly caught by tribal fishermen around the Keweenaw Peninsula. Yellow perch were collected from Mille Lacs (Minnesota) for total mercury analysis. Eight bands of Chippewa have the opportunity to harvest around 100,000 pounds of perch annually from the lake, yet these fish had not previously been comprehesively analyzed for mercury. This study found that yellow perch from Mille Lacs had mercury concentrations below 0.2 µg/g. Thus they are safe for consumption by even the most sensitive population segment (i.e., women of childbearing age, pregnant or breastfeeding mothers, and young children). Manoomin (wild rice) is important to the culture and economies of Lake Superior Chippewa tribes. Manoomin is found in some areas of Wisconsin that are located near sites of potential copper, zinc, gold, silver, and lead mines. The Environmental Section initiated this study to determine the metal content of manoomin tissues from eight bodies of water in the Wisconsin 1837 and 1842 ceded territories. In addition, muscle tissue from snails, clams, and crayfish were analyzed for concentrations of nine metals. Fish from the same area were analyzed for mercury content.